The Senate on Wednesday started debating its first comprehensive energy legislation since the George W. Bush administration, a bipartisan measure meant to update the nation’s power grid and oil and gas transportation systems to address major changes in the ways that power is now produced in the United States. Since passage of the last major energy law, in 2007, the United States has gone from fears of oil and gas shortages to becoming the world’s leading producer of both fuels. The use of wind and solar power is rapidly accelerating as those sources become cheaper than fossil fuels in some parts of the country. And President Obama’s clean air regulations are reshaping the nation’s power systems, as electric utilities shutter coal-fired power plants and replace them with alternative sources. But the nation’s energy infrastructure has not kept pace with those changes. Throughout the Obama administration, partisan differences over energy policy and climate change meant that meaningful energy legislation had essentially no chance of passage. When bills were offered, they were partisan measures meant to score political points rather than to enact substantive policy. People tracking the process on both sides of the political divide express some optimism that this time may be different and that the new legislation could make it to the president’s desk. That will depend on whether debate over the bill spills into the presidential campaign, where it could be used as a proxy for issues like climate change, oil and gas drilling and Mr. Obama’s regulatory agenda. The energy measure is co-sponsored by the Republican chairwoman of the Energy Committee, Senator Lisa Murkowski of Alaska, and the ranking Democrat on the committee, Senator Maria Cantwell of Washington. It is a rarity in today’s largely gridlocked Congress: compromise legislation that has been carefully written over months of hearings, passed through the energy panel on a bipartisan vote of 18 to 4. It has the support of the Senate majority leader, Mitch McConnell, Republican of Kentucky, and the minority leader, Harry Reid, Democrat of Nevada, who are usually seen strategizing to block the other’s agenda. In order to achieve a bipartisan consensus, Ms. Murkowski and Ms. Cantwell had to significantly scale down the scope of the bill. It is chiefly focused on modernizing energy infrastructure and improving energy efficiency. It does not include language to drastically increase fossil fuel production, as most Republicans would like, nor does it boldly address climate change, as most Democrats want. The 2007 energy legislation was passed just two years after a previous one. Before that, the last major energy law was passed in 1992. The current bill would give a win to fossil fuel producers by requiring the Energy Department to accelerate approval of permits to build coastal terminals for shipping American natural gas abroad. The bill would also help producers of renewable energy. The cost of wind and solar power has plummeted and its use is spreading. However, in order to use those sources on a wide scale, electric utilities need the ability to store the excess power produced by them — by essentially building big batteries — that would then release the power onto the grid when the wind does not blow and the sun does not shine. The new bill would require operators of the electrical grid to perform major upgrades to the system, with a focus on building new large-scale storage systems for electricity. The bill would create and strengthen several programs devoted to improving energy efficiency in buildings and address the threat of cyberattacks on the nation’s electrical grid. The bill would also deliver a long-sought victory to conservationists by permanently authorizing the national Land and Water Conservation Fund, a program for protecting and maintaining national parks and wilderness sites. While most provisions in the bill have bipartisan support, it is possible that some lawmakers could add “poison pill” amendments that would doom the bill. For example, Republicans leaders expressed anger about a recent Interior Department plan to halt new coal mine leases on public lands, and could add a provision to the bill to undo that plan, which would almost certainly attract a presidential veto. Also, Mr. Reid said Wednesday that he expected to use the energy debate as a platform to bring up the lead poisoning crisis in Flint, Mich., with Democrats offering amendments aimed at improving water safety. Senators are expected to start voting on amendments to the bill on Thursday and continue through next week. The White House on Wednesday said that Mr. Obama supports most of the bill but has concern about some provisions. 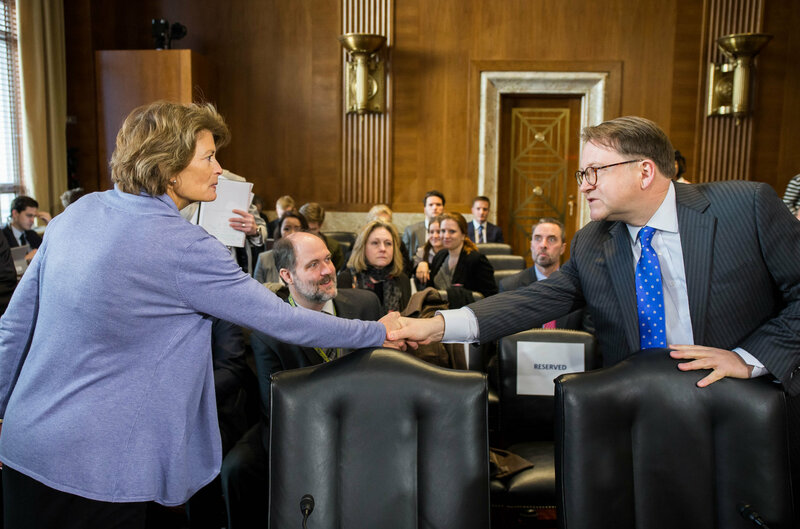 One of those is the provision aimed at expanding hydropower, the one energy issue that fully unites Ms. Murkowski of Alaska and Ms. Cantwell of Washington, where hydropower is a central part of the energy mix. Just hours after senators began debating the bill, it came under attack by both liberal and conservative advocacy groups. In a letter to senators, the Sierra Club complained that the bill’s section on energy efficiency in buildings would actually roll back some existing efficiency standards.